Aaron J. Nelson's passion for acting has led him to roles on the biggest stages on both Broadway and Television. Currently, he is the star of the Highest Grossing Broadway musical in history, Disney's The Lion King, playing the role of Adult Simba. In 2012, Aaron made his network television debut as a guest star on the hit tv series NBC's Chicago Fire (2012). 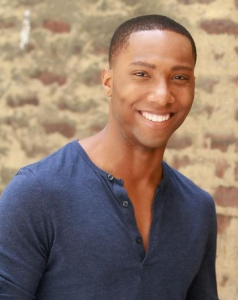 Aaron, a Chicago native, began his career at the age of 5 years old appearing as a clown in the Ringling Bros. Circus. A Classically trained actor and singer, Aaron has portrayed characters ranging from Shakespeare's Richard III to Tom Collins in RENT. He also studied On-Camera Acting at the prestigious John Robert Powers, who's Alum also include Josh Duhamel, Robert Townsend, and Henry Fonda. In 2009, Aaron was casted as a character performer for Walt Disney World, bringing to life characters such as Goofy, Captain Hook, and the SPD Red Power Ranger. Aaron portrayed James Harden on Investigation Discovery's True Crime with Aphrodite Jones (2012). Aaron played the supporting role of Jack in the independent film The United States which won the Golden Reel Award at the Nevada Film Festival in 2013. Also in 2013, Aaron played one of his most challenging roles to date portraying the various roles in critically acclaimed and award-winning play "columbinus 2.0" at the American Theater Company. Not afraid to step up to even the biggest tasks, Aaron is the first Simba since the late Jason Raize created the role in the 1997 Broadway premiere of The Lion King to play the role on Broadway without having previously been a member of another Lion King cast. He received his Bachelors of Arts from Columbia College Chicago with a degree in Arts Management (2012). Aaron's hobbies include studying Mixed Martial Arts, playing football, and Weight Training. Aaron's dream is to one day portray one of his favorite Comic Book Heroes on the Big Screen.